One of the things we love so much about our blog, is the opportunity to discover new interesting and emerging designers in the fashion industry. It’s something we truly pride ourselves on to share with our readers. With our 52 Interesting People posts, we can share with you a little more than just our insight- coming straight from the creator itself. This week we introduce to you… Linell Ellis. 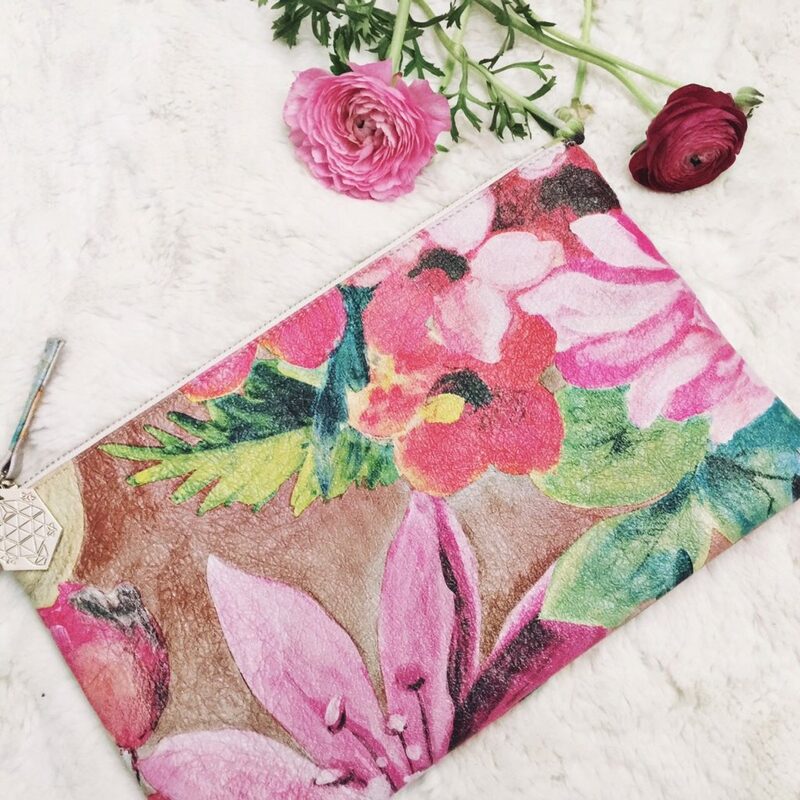 Linell Ellis, an up and coming handbag designer, happens to be a local to the metropolitan area with quite the eye for aesthetics. Not only did we have the chance to try out these clutches ourselves, we also had the opportunity to ask the designer herself a few questions. Helping us understand the magic behind the collection from the inspiration to the details plus a few fun facts and advise on how you too can make your dream a reality. 52: What did you want to be when you were a little girl? Linell: I wanted to be a nurse. I have always loved helping people. It makes me happy. 52: In one word, what describes your brand the best? 52: What was your inspiration for your Spring/Summer collection? Linell: For the spring collection the inspiration was “A Place in the Sun” The focus being color and texture. We started in Morocco and looked at all of the color and texture from sand, architecture and open air markets. We then looked at another place in the sun in a very different part of the globe, a caribbean location, and compared. We found close similarities in color and texture. two different parts of the world with the sun generatinga lot of similarities. This season celebrates color and texture and all of the beautiful places around us where we can experience both. 52: Who is your role model? Linell: My Mother. She is the epitome of beautiful both inside and out. A virtuous woman. 52: What’s your personal style like? What would be your go to everyday outfit? Linell: I would consider my style to be classic with a bit of edge. I am most comfortable in jeans and tee. But I love to dress up! For anything really. Just because. I love shoes and have a serious addiction to handbags. 52: What is your advice for someone that is looking to start their own business? Linell: Learn as much as you can about the industry you are entering. Always be authentic. Be your biggest cheerleader and find someone who can be the cheerleader on days when it gets tough. Be open to the journey wherever it may lead and never forget to help someone else. I am a big advocate for mentorship. Find a mentor and build that relationship. 52: We fell in love with every clutch you make so this question might be the hardest, but which one is your favorite and why? Linell: That is definitely a hard one! Each clutch is named after a woman in my family for specific reasons. However, I am partial to the Novelty Print Florence Envelope Clutch. I love the beautiful colors. It makes a statement without being too over the top. It’s whimsical. I love whimsy. 52: Our perfect girls night is a nice bottle of wine and a spread of cheese with great company. How would you describe the perfect girls night? Linell: Ohh that sounds great!! Nothing beats a good bottle of Malbec, great conversation and lots of laughs. If you start early enough you could probably add some shopping in there too. 52: What’s the biggest risk you’ve ever taken? Linell: Leaving corporate america to build Linell Ellis. Sometimes it’s difficult for me to grasp how something can be both terrifying and completely fulfilling at the same time. 52: What makes a great partner (in life and in work)? Linell: A great partner in life and work is someone who balances you. They are your greatest supporter but they also challenge you to step outside your comfort zone. They believe in you and your dreams. Just as you do for them. A great partner in life is someone you truly like. When you like each other it will last beyond the sparks and fireworks. It’s beyond “love” and “lust” and it makes it easy to light the spark over and over for 50 years or more. Someone who is committed to the journey. The entire journey. Someone who makes it easy to laugh at yourself. I am lucky because my partner in life is also my partner in work. So for me a great work partner is one who is good at the things I am not. He is honest and loyal. He is a good communicator and that is important for a life partner too! 52: What’s next for the Linell Ellis brand? Linell: We are really looking forward to continuing to grow and share the brand with our customers. I am always focused on improving and evolving my design skills so that we can go with the Linell Ellis girl as she goes through life.We have a great online store but now we are focused on offering Linell Ellis to boutiques both in the US and internationally. With all that we also have a few Linell Ellis Men Accessories in the plans. 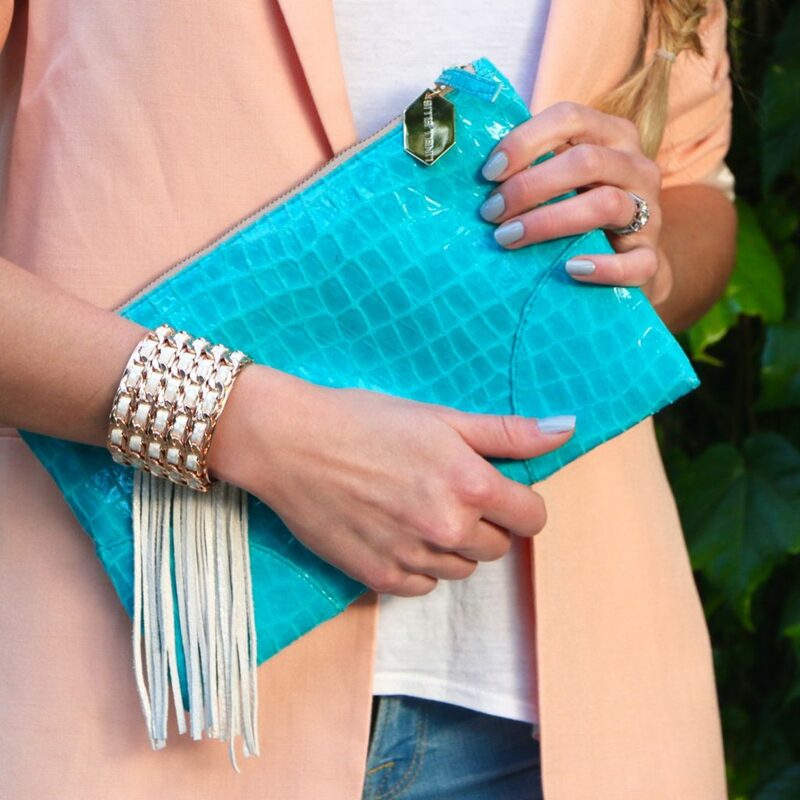 Click here-> It’s All About the Details for more styled shots of our favorite new leather clutches from Linell Ellis and don’t forget to check back in for our next 52 Interesting People Feature!